Skylight Design, Greenhouse's, and more! Daylight Designs represents several of the nation’s leading skylight manufacturers which ensures that quality is designed and built into all of our products from the start. Wasco has been manufacturing skylights since 1935. Today Wasco supplies nationally with a plant in Reno, Nevada and one in Wells, Main manufacturing a full line of quality skylights that ranges from acrylic, cellular polycarbonate, to glass – structural & unit skylights with a wide range of finishes and limitless design possibilities. Wasco provides customized versatility for commercial and residential projects as well. 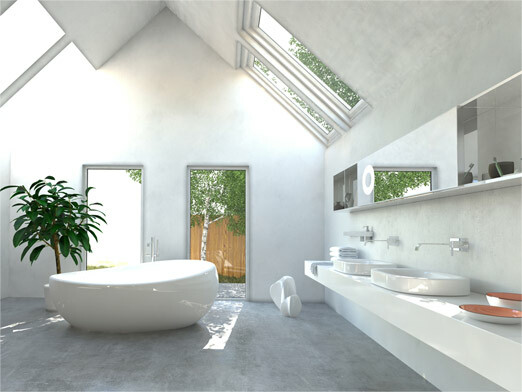 Wasco skylights meet stringent design criteria: N.F.R.C. certified and tested, O.S.H.A. compliant fall protection, snow load, wind load, and signed and sealed engineering calculations. Quality, development and improvement are important keywords at VELUX – not least in their test department, where products are continuously exposed to all kinds of tests as an integral part of their company’s efforts to develop and improve their products. VELUX America Inc. manufactures two main types of skylights including the “Deck Mount” skylight and “Curb Mount” skylight. All models come with either Comfort (Low-e) or ComfortPlus ( Low-e laminate ) glass types. In addition, a variety of flashing kits are available for all types of roofing material including tile, cedar shake, asphalt, and metal. VELUX America Inc. also provides Skylight Blinds, Shades, and manual and electric Controls for operation of both Skylights and Accessories.